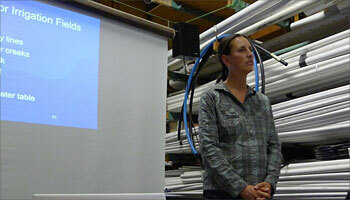 We signed up, and attended a workshop at the Urban Farmer Store in San Francisco. I first encountered Laura in reading “The Guerrilla Greywater Girls Guide to Water,” and had taken a tour of their system in Oakland ten years ago with the getup class. I also highly recommend the book Dam Nation: Dispatches from the Water Underground , which she co-edited, a thoughtful and galvanizing collection of essays about water issues. Laura is passionate about greywater, and believes in making it accessible to all. She has so much practical experience, and was able to answer any questions that came up. The best part is, she made herself available the day after the workshop to visit everybody’s houses and evaluate their plans. 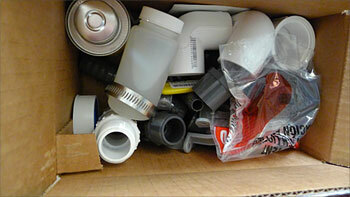 I had always wanted to install a greywater system, but had felt daunted by legal issues and logistics. Since those days, it’s gotten much easier to use greywater legally. With a laundry to landscape system you don’t need a permit in California, and the city has made it much easier to do it yourself. The workshop started with a short video from a This Old House episode (select scene 3 after the video starts playing). 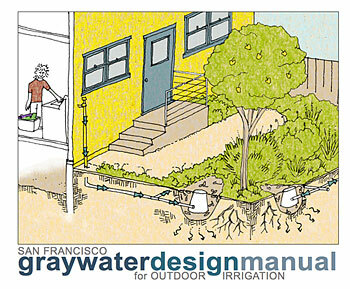 You can watch Laura introduce greywater and the pilot program and help the homeowner install a system in SF. We were given handbooks (pictured above), and the kit (below), along with some 1″ hose, and lengths of pvc, just about everything we needed. I wound up spending a little more for a few add-ons. The Urban Farmer Store is pretty cool, everything you would need to small to large scale irrigation, and great workshops. Make sure you use the bathroom if you go in there cause they have one of those nifty Australian toilets featured in the video. We were also able to rent (for free) a bag with tools needed to make it happen. We looked at our handbooks, did some calculations about how much water our washing machines were using, and where they were placed in relationship to the garden. Since our machine is an older top loader, we will gain quite a bit of water for our garden during the dry season. I was surprised at how much water it uses. The location of our machine is ideal, because, since it’s so much higher than the garden, we don’t have to worry about the water running uphill. There’s an online version of the handbook here, which is invaluable. For me, the place where I use the most water in the garden is in my compost. I have a big raised bed compost, and we fill it full of so much dry brush that it’s really challenging to give it the water that it needs without spending too much money. I had been using a soaker hose that I would remove to turn it, but using our laundry water would be awesome, and then we can direct the finished compost to where it’s needed in the garden. We’ll probably have some more irrigation coming off the compost feed, but that’s the priority. We talked about different strategies for distributing the water in the compost as well. So, because Dave and I have had limited time to work on it together (this is our busiest time of year) we’ve been taking it in chunks. We had recently installed a drip system, and, while we won’t take it out, we won’t be able to use the smaller fittings for greywater. We decided to keep it in place and transition over slowly. We’ve gotten a lot done already, and I’ll save the next post for some of the step by step process. There is another workshop coming up tentatively scheduled on October 6. Such a great opportunity! Full details about the program and sign-up for San Francisco residents is here. Do you have anything like it in your town? It makes sense for everyone, both the city and the urban farmers. In my lifetime, I have seen so many changes in our wet places. I grew up near the Hudson and East Rivers in New York. I’ve been swimming in rivers in California for 30 years. Here in the West, we see our landscape dry up this time of year, towards the end of the dry season. Water is precious, and being able to use what once went down the drain to the sewer feels so right. 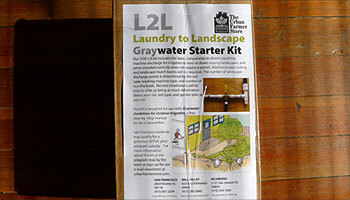 How are you using greywater? Do you have any tips to share? It seems like such a no brainer. It’s too bad it’s not legal in so many areas.